Nuts are good to have as a stand-alone snack or to add flavor to desserts, salads and main meals. According to the British Heart Foundation, regularly including nuts in your diet may help to improve your cholesterol levels, and trainer Charles Poliquin recommends having a handful of plain nuts as a low-sugar, craving-busting mid-afternoon snack. A 2003 study in the "International Journal of Obesity and Related Metabolic Disorders" found that subjects on a low-calorie diet enriched with monounsaturated fatty acids from almonds lost more weight than those on a typical low-calorie, high-carbohydrate diet. 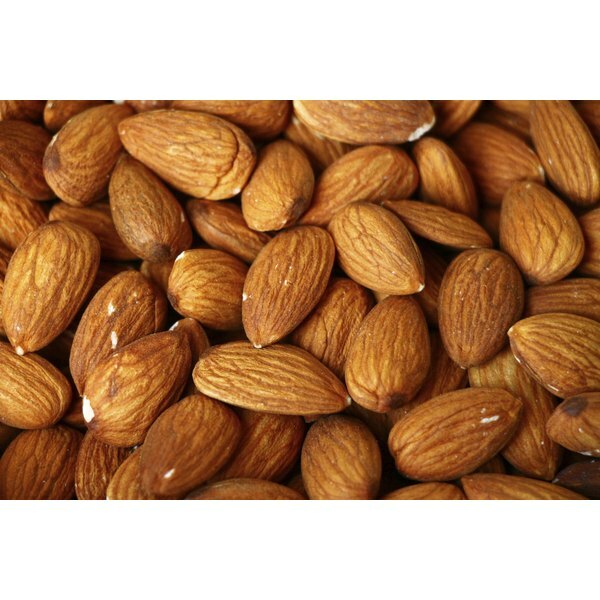 A small handful of almonds -- around 1-ounce -- is a high-protein snack, full of healthy fats and other essential nutrients. Around half the fat found in cashews is of the heart-healthy, monounsaturated kind, which, according to nutritionist Dr. Jonny Bowden, may help to reduce your risk of heart disease, cancer and other illnesses. Try adding cashews to stir-fries, salads and curries for added flavor, texture and nutrients. Macadamia nuts are very calorie-dense; one nut can contain up to 18 calories. However, around 86 percent of the fat in the Hawaiian nut is monounsaturated. To keep your portions modest and still reap the benefits of healthy fats and sumptuous texture, mix a small amount of whole or chopped macadamia nuts with lighter foods, such as chilled veggie salads or unsweetened dried fruit. Like macadamia nuts, walnuts are slightly higher in calories than other nuts, but that shouldn't put you off from eating them. Walnuts are one of the to plant sources of omega-3 fatty acids -- essential fats your body must obtain from food, and that play a significant role in heart health and brain function. Pistachios are a slightly lower-calorie nut, containing only 161 calories and 12.7 grams of fat per 100 grams. Avoid the dry-roasted ones, which often contain added oils, calories and excessive amounts of salt. Pistachios also provide valuable amounts of B-vitamins, such as vitamin B-6. Dr. Bowden advises eating Brazil nuts as a way of protecting against cancer. Brazil nuts provide a huge amount of the trace element selenium, more, in fact, than almost any other food. A daily dose of Brazil nuts can help to protect your cells and boost your immune system. Peanuts aren't actually nuts. They're grown underground and are considered a legume. Due to their nutritional and physical similarities to nuts, however, they're often referred to as such. Peanuts rival strawberries when it comes to antioxidant content, and the former contain high amounts of the B-vitamin niacin, which is important for keeping your skin and digestive system healthy. Pecans are a good source of various vitamins and minerals, including thiamin, magnesium, iron, zinc and vitamin E. They also contain around 3 grams of fiber per serving. Make sure you eat your pecans plain and not as part of a pie if you're concerned about calorie control. On the other hand, pecan pie does provide more fiber and other nutrients than other high-calorie desserts, such as fudge cake. Hazelnuts may be a less commonly-eaten nut, but that doesn't mean that they don't posses good health benefits. They contain the plant sterol beta-sitosterol, which helps to lower cholesterol and reduce the symptoms of benign prostatic hyperplasia. Chestnuts, another less commonly eaten nut, also provides many health benefits. They are slightly lower in calories and overall fat than other nuts, and are a good source of dietary fiber, vitamin C, iron, potassium and magnesium.